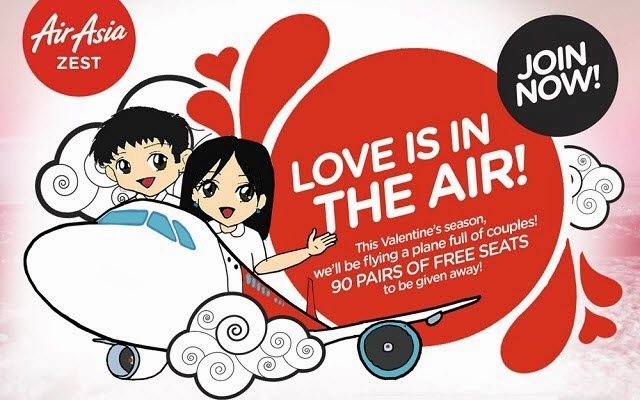 AirAsia Zest is giving away free seats to 90 lucky couples this Valentine's day through their #LoveisintheAir online contest. Have a date with your spouse, your fiance(e), your boyfriend or girlfriend, your partner or your best friend, at your favorite domestic destination for free by joining the contest! "Spending time with the one you love is always enjoyable and we wanted to celebrate Valentine's Day by inviting 90 lucky couples or pairs to fly with AirAsia Zest for free and spend some fun, quality time together, 30,000 feet above," AirAsia Zest Executive Vice President and Chief Operating Officer Joy Caneba said. 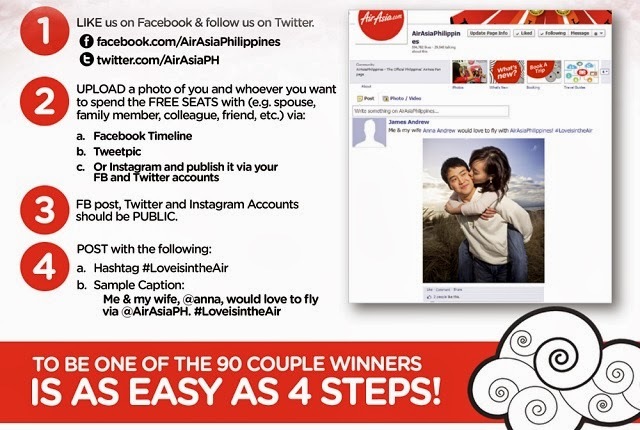 To join, you must submit your best photo AND use the contest hashtag #LoveisintheAir until 7th of February 2014 through Facebook and Twitter. You may submit multiple entries as long as you are using different photos per entry. If you win, you will be contacted via Direct Message (DM) and/or Private Message (PM) followed by an e-mail or telephone call from an AirAsia Zest representative. Mechanics are also posted on AirAsia Zest's social media page (facebook/airasiaphilippies) and are also accessible through http://on.fb.me/Lcge6b. "AirAsia Zest is a sociable brand and we embrace social media as it provides a fun platform for us to communicate with our guests and fans in a different way. #LoveisintheAir is a treat for all our loyal Facebook fans and Twitter followers. Our highly trained, experienced pilots, cabin crew, guests services staff and team also known as Allstars are all geared up to welcome the lucky winners on board. Let’s paint the skies red!" Caneba said. AirAsia Zest serves domestic destinations of Kalibo (Boracay), Puerto Princesa (Palawan), Cebu, Davao, Tacloban, Tagbilaran and Cagayan de Oro in the Philippines, with international points in Asia including China and South Korea from its main hub in Ninoy Aquino International Airport (NAIA), Manila and Mactan Cebu International Airport in Cebu. Find out more about AirAsia Zest’s exciting destinations and promo fare announcements via Facebook (facebook/airasiaphilippines) and Twitter (twitter.com/airasiaph).